Like last year, using a two-stage bidding process, with letters-of-intent, followed by full proposals for selected bidders. Letters of intent due March 31. Since this is a “Europe Year”, clearly we need to be thinking about a FOSS4G in Europe next year. Because Europeans are always looking to the USA for suggestions (right? ), I’ll gladly pass this free advice on to our brothers and sisters in the Euro zone… Don’t put it in Northern or Eastern Europe. Acceptable choices are only the French or Italian Rivera. I’m sure Prague, Budapest or Warsaw are wonderful cities and should be at the top of any trip to Europe. But to me that’s like having a conference in Chicago. Sure, there are wonderful things to do in Chicago, but eventually you wake up one morning and you realize the best thing about Chicago is that it isn’t St. Louis or Milwaukee. You don’t want that to happen to FOSS4G 2013, right? 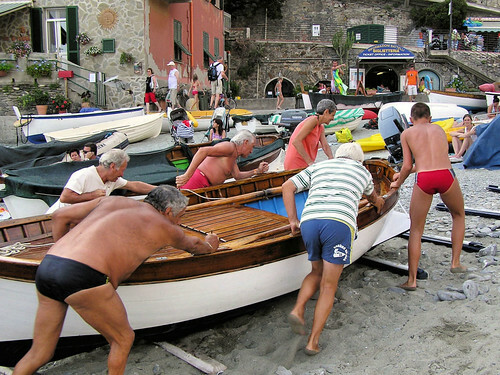 Plus who doesn’t want to see old men in speedos pull a fishing boat up on the beach (isn’t that what Italy is all about)?